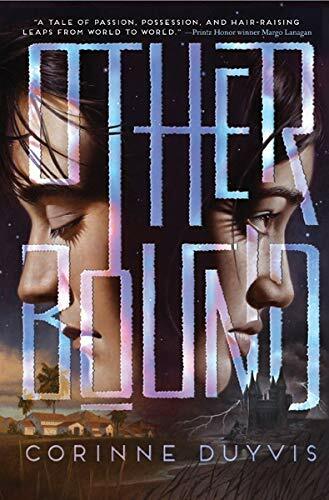 Corinne Duyvis's debut novel, Otherbound , is young adult fiction in the mode of Margo Lanagan or Frances Hardinge, which is to say that its genre classification comes from the age of its protagonists, as opposed to having anything else to do with its content—which can best be described as unflinching, although fortunately never gratuitous. As the title promises, this is a book which does a lot of examination of what it means to be bound, and what it can be like to have an unbreakably close tie to someone else, whether that bond is chosen or not, healthy or otherwise. In short, it's a complex book about slavery and freedom, and that means that terrible and wonderful things happen in it. Nolan Santiago, a teenage boy in contemporary Arizona, has been diagnosed with epilepsy, but that's not actually what's going on in his head. Whenever he shuts his eyes, even to blink, he finds himself sharing the sensory perceptions and thoughts of Amara, a teenage girl in a magical world called the Dunelands, and this has been going on for most of his life. These visions are so all-consuming that Nolan lost a foot as a small child when he was unable to remain present enough to avoid a car accident, and he has fallen into more than one coma when he could not pull himself free of Amara. She, however, is totally unaware of him. Nolan's life is a constant barrage of conflicting input in which he is unable to focus fully on anything, and his only real output is the series of journals in which he chronicles everything he knows about the Dunelands: languages, customs, and of course the minutiae of Amara's life. Amara, meanwhile, in addition to whatever is causing Nolan's presence in her head, has the magical power to heal herself from injuries, including those which would ordinarily be fatal. Before her powers manifested, when she was a small child, she was chosen as a palace servant for her country's royal family. Servants are not permitted to speak, read, or write, and communicate using a complicated sign language. To enforce this, Amara's tongue was removed, long enough before the manifestation of her powers that it has not regenerated. A few years later, the royal family was replaced in a coup, and Amara—disconnected from much of the world because of her inability to use vocal language, marked as a bonded servant by a magically unremovable tattoo—was sent on the run in the care of a mage, Jorn, with the single royal survivor, the young princess Cilla. Cilla was cursed by mages in the employ of her family's enemies during her escape, and the curse would be fatal without Amara's constant presence. Whenever even a drop of Cilla's blood is exposed to the air, everything around her, stones, plants, wind, trees, walls, or anything else available, attacks the site of the bloodshed. Amara has spent her entire life serving as the distraction for Cilla's curse, smearing Cilla's blood onto her own skin and healing the resulting damage until Cilla ceases to bleed. And Nolan, through Amara, has also spent his entire life in this particular kind of pain. He desperately wants to have his head to himself, certainly, but he also wants to find some way to improve things for Amara. Amara is uncertain of her own wants and desires, having been almost literally chained to Cilla for so long, but as time passes and Jorn becomes more and more abusive, it also becomes clear that their party's life of continuously running and fighting off enemy mages cannot go on forever. The intersection of these three adolescents forms the heart of the book, as they attempt to find ways to save or at least get away from each other—Nolan, of two worlds and neither, used to observing but also used to failing whenever he tries to act; Amara, with no magic she knows how to use for her own purposes, beaten almost into oblivion but never quite into giving up on herself entirely; Cilla, raised to rule but incapable even of brushing her own teeth without genuinely needing a spotter in case her gums bleed. This tangle of teenagers, each of whom has power of a sort but also severe limitations, is surrounded by two worlds which are depicted with equal complexity and compassion. Nolan's life in Arizona may sometimes seem less real to him than the Dunelands do, but it never feels that way to the reader, and the Dunelands themselves are lived environments, in which there are different ethnic groups and customs, various wildlife, ways people dress, and all the other tiny details that make up a real-feeling world. It feels, too, very psychologically realistic that the concerns of the book's characters are far less about the institution of palace servanthood itself, even though it is obviously a horrific and inhumane system, and more about the ways that that institution has affected them personally, in the concrete rather than the abstract. Duyvis almost never falls back on default depictions or on clichés, even about the tiniest details, such as Nolan's sister's study of acting methods for her middle-school play. Every aspect of her work is nuanced, thoughtful, and three-dimensional, which is why the terrible things that happen to people in it never become overly depressing. As Lanagan and Hardinge have done, Duyvis seems likely to build as great an audience among adults as she does among teenagers who love good books.